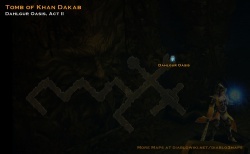 The Tomb of Khan Dakab is a dungeon that can appear underneath the Dahlgur Oasis. It is not part of the quest line but it does contain an event, lore and achievements. Waypoints are special plates on the ground that form a network of jump points allowing players to instantly teleport between them. The nearest waypoint for Tomb of Khan Dakab appears at a random location in the Dahlgur Oasis. There is also one in the Path to the Oasis which is a very short path always at the very bottom of the area. The Last Will of Khan Dakab - Requried for Judge of Character achievement. Tomb of Khan Dakab is in some way involved in the following achievement(s). This page was last edited on 25 March 2015, at 14:45.